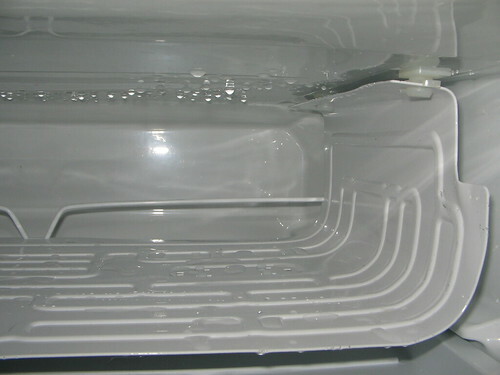 Friends, this is the freezer box of a compact Kenmore refrigerator from Sears. See the raised labyrinth-like pipes lining the platform? That’s a refrigerant coil. It contains freon (or some other non-ozone-depleting refrigerant substance for newer units). The coil is made of very thin and fragile aluminum. This is why technicians very wisely advise against defrosting freezers with knives or ice picks. You see, sometimes you’re being very careful to stab at only the ice and not the refrigerant line, but ice is very unpredictable stuff, and sometimes the knife can glance off and hit the coil. The tiniest nick will puncture the coil and release refrigerant with an ominous hiss of freezing vapor. The gas itself is inert and odorless, completely harmless to you as long as your domicile is properly ventilated — although if it’s freon, it depletes ozone in the atmosphere, so it is harmful to the environment. Without that substance, your refrigerator and freezer will not work. These days, the process of repairing the nick and refilling the refrigerant is usually more expensive than just throwing out the whole thing and getting a new unit, especially in the case of a compact like this one. So don’t use an ice pick or a knife to defrost the freezer. Instead, turn it off, unplug it, and let the ice melt, making certain to drain the drip drawer when it gets full. If you want to speed up the thaw, boil water in a shallow pan and leave the pan on top of the ice. But don’t be impatient and resort to sharp things. This lesson brought to you by the Brownpau School of Hard Knocks. And Sharp Things.